Here's a new concept for spies (or people who like to throw things away)--disposable "Flashkus" flash drives. 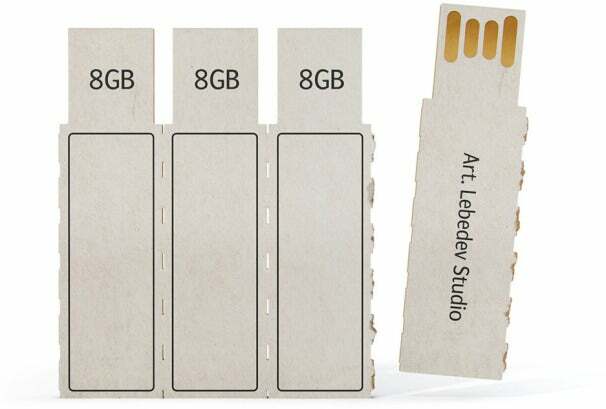 In the near future (hopefully), you'll be able to toss your data in the dumpster with these 8GB or 16GB cardboard drives designed by Alexei Lyapunov and Lena Ehrlich at Art Lebedev Studio. It looks like these drives will be cheap and produced on a cardboard strip, so you'll need only to tear one off and write a note on it if you want to give your friend a song, say, or carry some quick data with you. The Art Lebedev website suggests (translated from Russian) that these portable, disposable flash drives will be "even simpler" than floppy disks. I'll assume that means they'll be easier to part with (more disposable, if you will). Yes, the Flashkus is still just a concept, but it doesn't seem like one that's too far off. My guess is that the first people to use them will be CES vendors, as electronic press kits. Follow Sarah on Twitter (@ geeklil ) or on Facebook.